The Department of Intermedia Art provides an environment that nurtures the development of a new breed of artists capable of expressing their own visions in their own ways, based on conceptualization skills unbound by preexisting techniques and media. Its goal is to develop students who have points of view that are open to society at large and take flexible and active approaches and who are able to communicate freely with individuals with diverse ideas and different sensibilities. This department was established in 1999 to address new expressive domains previously covered only in fragmented ways by the university’s existing departments, to seek out and identify new expressive media, and to encourage works imbued with an awareness of the coming times. 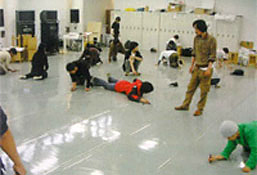 Students in the department are permitted significant latitude to study not just expression using visual and computer media, but beyond, encompassing performance art and other forms of physical expression, as well as installations that turn space itself into an expressive medium. Study within this department exposes students to a wide range of expressive media and imparts a perspective that turns their vision to the larger society. It also encourages them to hone their sensitivity to the spirit of the times. After graduation, students are expected to be active in a wide range of fields, promoting creativity and expression. For example, graduates should be able to propose and express ideals for society and human beings and develop new media for the next generation that revolutionizes the interaction between media and society, and to create venues for art rooted in the community. The department intends to develop a level of talent in our students that allows these expectations to be easily surpassed. The Department of Intermedia Art seeks to approach the information of the world of knowledge that human beings have created in new ways, focusing on the expressive capabilities of human beings and considering the materials and techniques that support these capabilities as spatial, audio, visual, computer, language, physical, and other types of media, as well as learning about these from a comprehensive perspective. While the entire curriculum proceeds by encouraging students to engage in personal expression through their creative work, it also includes activities that enable students to engage in learning, research, and creative activities and to discover and develop means of expression based on the individuality of each student through courses addressing a succession of different media. Faculty: In addition to the study of media within the domain of “fine arts,” such as drawing, handicrafts, photography, and film and video, the curriculum encourages practical learning of “what fine arts will come to mean in the future” through a study focused on the introductory tenets of various expressive media, such as the body, music, and computers. The basic principle is to nurture individuals demonstrating potential in the domain of creative work as well as in all Art Environment Support activities. The curriculum is designed in a way that the students can engage in creative work across domains in a cross-disciplinary manner in their respective studios, while learning through theoretical lectures. Master: In continuation of Faculty education, the Master’s Program enhances specialization. Furthermore, the course content is not divided into narrow domains. In the first year, a common seminar called “Art in Context” is conducted. Students actively participate in a wide range of related fields, are exposed to a variety of special lectures and seminars not limited to Fine Arts, receive advice from diverse perspectives, and acquire in-depth learning about creative expression. A shared exhibition termed the Atlas Exhibition is also held. The course encourages students to proactively engage in projects that address issues at the cross-roads of modern society and in presentations about society that focus on practical orientation. Doctor: Students who have obtained the Master’s degree can further expand their specialized research. They will conduct in-depth research in their own specialized field in conjunction with their creative work and study the theoretical research that underlies these activities. While engaging proactively in presenting their creative work and research, the students eventually complete a doctoral thesis. Faculty：The Bachelor’s degree is awarded once the abovementioned curriculum policy has been fulfilled and the final year of graduation work has been thoroughly assessed. Master: The Master degree is awarded once a review of the completed creative work and the commentary on the creative work or the graduation work has been conducted by the Thesis Review Committee comprising the department supervisor and supervisors in related fields and once it has been judged that the abovementioned Master curriculum policy has been fulfilled. Doctor: The doctoral degree is awarded after a review of the thesis and the creative work has been conducted by the Degree Conferment Review Committee comprising the supervisor in the concerned research field and teaching staff in related fields and once it has been judged that the abovementioned doctoral curriculum policy has been fulfilled. The faculty in the Department of Intermedia Art consists of specialists from a wide range of fields, including working artists, scholars, critics, art producers, and designers. While students currently learn through apprentice work that includes educational, research, and creative activities alongside professionals in venues around the world, the curriculum focuses on efforts to ensure that work is not sealed within individual studios. Dedicated studios and seminar rooms are available for handcrafts, photography, film and video, music, performance art, and desktop publishing. Dramatic innovations in information and telecommunications technologies and economic globalization are dramatically transforming the meanings of works of art. These transformations concern the issue of expression. Human beings have only one life to live, and the various expressions conducted in that process cannot be separated from individuals’ own cultural, social, political, and economic contexts. Human behavior and awareness is determined by a complex network composed of the poles of urban vs. rural environments, shifting community organizations, transformations in industrial structures, and the tensions of international relations. Unconfined to the domain of art, expression deals with issues at the root of individual existence. Accordingly, the Department of Intermedia Art seeks to be a place where students can learn and express themselves in cross-disciplinary ways, through the addition of diverse media including visual expression, physical expression, and computer literacy, as well as broad surveys of the traditional domains of art. In the first year, students familiarize themselves with the fundamentals of powers of expression while learning the characteristics of a wide range of media, including drawing, handcrafts, the body, photography, film and video, music, and design, revolving around practical training in the studio. In addition, students improve their basic capabilities to read and comprehend, their imaginative capabilities, and their capacity to think, through intensive work in areas like language and computer basics. Results of first-year studies are displayed to the public in Art Path Toride, an event staged and managed by students themselves. In the elective studio curriculum in the first semester, students seek to develop their own independent methods of expression unconstrained by media types, by addressing diverse media in selective and complex ways and building on what they learned the first year in studios. In fieldwork and editorial work in the second semester, students seek out off-campus venues and learn about the series of processes through the realization of a single work. This is done through activities ranging from in-depth research through discussion and exchange, conducted by participants with a wide range of personalities and opinions, based on group work. Third-year students are assigned to individual instructors’ studios. The content addressed in each studio covers a wide range of subjects; students are expected to continue to broaden their expressive capabilities by applying both individual work and studio activities. In addition, in elective IMA lectures held in the second and third years, students are exposed to opportunities to expand their knowledge of expression through short-term intensive lectures for students from both years, led by a diverse range of guest artists and instructors invited from outside the university. Research trips on ancient art deepen student knowledge of traditional Japanese culture by viewing ancient Japanese art, chiefly in Kumano, Nara, and Kyoto. Students crystallize the results of their creative and research activities throughout this year by focusing on their thesis projects. Under the guidance of their studio instructors, they advance through this year in steps, exhibiting works in progress in the first semester and works for preliminary examination in the second semester. Students take the lead in working toward exhibition of their final works through individual creative activities and planning and managing the exhibition themselves. The Department of Intermedia Art launched its master’s degree program in the 2003 academic year and its new doctoral program in the 2005 academic year. The graduate-school program has been organized as a joint structure not restricted to on-campus resources, but in partnership with off-campus research institutes, nonprofit organizations, government, and industry. Projects put into practice in the program have led to consistent results by addressing issues at the crossroads of today’s rapidly changing society. In addition, the program continues to engage in fundamental theoretical research to support practical projects. As well as reexamining the history of expression from new perspectives, students pursue theoretical studies to seek out the future of expression and associated possibilities. As sites for educational and research activities, the program creates venues for a wide range of encounters, valuing the various points of intersection among educators and among students, as well as between educators and students, creators and recipients, audience and performer, and among individuals generally. While calls have been heard in a wide range of places for migration from a model based on propagation of knowledge to one based on the discovery and resolution of problems, individuals must nevertheless possess strong powers of expression to overcome the barriers between educators and students. The powers of expression developed in fields of artistic endeavor are likely to be particularly useful in creating dialogue among a wide range of people. In the master’s degree program, 12 instructors provide guidance for a fixed number of 24 students per year. In this way, the program creates an educational and research environment for a small number of students.Individual guidance is provided in the doctoral program. In preparation for the master’s project, advisers provide intensive individual guidance, helping to provide each student with an awareness of issues, motivation, skills, and a future direction. As core training, a diverse program has been established that begins with lectures by the entire faculty the first year, courses given off-campus, and opportunities to receive feedback on works and essays from artists and critics active outside the academic world. Students in the doctoral program are expected to acquire the knowledge, experience, discernment, and skills needed to succeed out in the world as artists, researchers, and educators. Degree candidates are encouraged to seek opinions on their projects through original research and creative work drawing on both on- and off-campus resources. The program provides the opportunities and environment required for these goals. 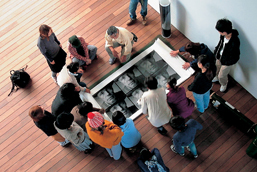 Until now, the department has proactively provided opportunities for international exchange in various ways, including seminars and lectures led by artists and curators invited from overseas, an exchange program with the Bauhaus University in Germany, and joint exhibitions with the University of Veracruz in Mexico and the Modern Art program at New York University. Students currently enrolled hail from a wide range of overseas countries, including South Korea, Germany, Taiwan, France, Belgium, and Kuwait.